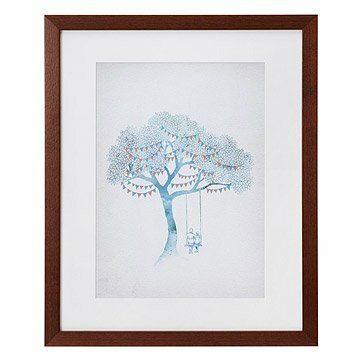 This sweet print depicts an embracing couple sitting perched on a tree swing for two. Trained as an architect, David Fleck"s illustrations combine the complexity of architectural drawings with the magnificent cities he's seen throughout the world and in his mind's eye. In this print, a couple embraces while sitting perched on a tree swing for two. Above them, an azure tree trimmed with triangular banners seem to flutter in the wind, giving the scene an air of celebration. Whether given as a first or fiftieth anniversary gift, this print makes a meaningful statement about love's ability to grow stronger and more beautiful with each passing year. Designed in Scotland. Printed and framed in Portland, Oregon. Working daily between illustration, humanitarian architecture, and design, David is interested in the crossover between art, architecture, people and our cities. Having trained as an architect, his illustrations are informed by the detail and complexity of architectural drawings, creating discovery, a world of chaos and experience waiting to be uncovered and shared in each image. Inspired by writing, travel, and his own experiences exploring cities, David’s images are full of stories. "Until I have a go at drawing something I often don’t realise just how complex and beautiful it really is. So that's what I try my best to show- complexity, imperfection, beauty, and a bit of naivety too." The color scheme of this picture matched our bedroom decor perfectly. I opted for the unframed version so that I could find a frame that closer met our needs. The matting is very thick, so professional could be necessary if you are not handy. We were able to find a fix with a store-bought frame. Love everything about this print.